Will Smoking Ever Stop Being Glamourised? I haven’t smoked a cigarette for three months. That doesn’t seem like a huge deal or amount of time but I used to puff on one most days (and sometimes I’d even have one whilst reading the morning paper) so it’s fair to say I was a bit (or a lot) addicted. I’ve always grown up with my mates smoking around me and a few people in the family have had an on-and-off affair with cigarettes so it’s just been one of those things that I didn’t really analyse; it was just a casual lifestyle choice. But I’ll tell you what, since giving up I’ve never felt better: full of energy, better sleeping patterns, shinier hair and better fitness levels. I’ve really noticed a difference, and why should I even be surprised by that? Smoking is really bad for you – we’ve had doctors, biologists and disappointed parents telling us for years but for some reason most people just shrug it off: meh, whatever, my lungs will be fine. “I’ll just have one more/ I’m pissed/ I’m a social smoker”. Like with most break-ups, once you’ve moved on and it’s behind you, you wonder why you even went there in the first place. I feel like that with smoking. Now I’m sitting in smug “Non Smoker” camp, ticking that box on the doctor’s form and not lying for once. When sitting on the bus I now spot people puffing away at 8am along Kingsland Road with their little ashtray and black coffee and I watch as those fumes going into their mouths and out their noses. Now, I can’t even remember why I did it or why I received any pleasure from putting so many horrible chemicals inside me. “You know they put rat’s poison in Marlborough Lights”, people would say, whilst continuing to smoke on said Marlborough Light. I can’t even really remember what led me to think I needed to stop. I think with most things in my life whether it’s a small decision or a milestone moment, I just wake up one morning, look out of the window and think “that’s enough”. The decision was cemented. Admittedly I did go out and purchase an e-cigarette which actually has really helped whenever I get a bit tipsy or stressed out; basically it’s a bit of a safety net from any of those moments that could potentially be an ‘oh f*ck it’ moment. Especially when on a writing deadline I’d need some sort of ‘break’ so I would have a little go on the e-cig or have a cup of tea. I once tweeted Caitlin Moran asking her how she wrote How To Be A Woman in 5 months and she replied “smoke a f*ck load of cigarettes”. SEE. It’s happens. Even though I am bigging up the e-cigs for helping me kick the habit, things like the new Shoreditch “beyond-Hipster” establishment called the Vape Shop makes me cringe a little. Fair enough if this ‘vaping’ malarky becomes a new cool trend, but then it would silly if people started ‘vaping’ for the sake of it. They’re not glam in the slightest. It basically takes two hands to even pick up the thing to put in your mouth – they’re pretty heavy and awkward. Since giving up I’ve seen it around me more than ever. I smell it as someone passes me with a lit cigarette, or can tell if someones been smoking when they hug me. I never used to be aware of it until now (because I was ‘one of them’) but it really is the worst sort of smell, especially when it’s a bit stale, like sweat. We are all polluted enough as it is in London, let alone having another layer of dark smog over us. I also see it more than ever on the TV and in theatre. It’s always been there, but it’s also a sign of showing a particular time in history: whether it’s setting the 1920’s scene in the Great Gatsby with their fancy cigarette holders or showing the old advertising world with workers smoking in the office in 1960’s Mad Men. Even in Bridget Jones it’s cool in a weird twisted way – smoking round the table at the dinner parties, “Oh Bridge! Pass me a lighter darling”. We know that smoking used to be glamorous, I mean the fact that Audrey Hepburn and Marilyn puffed away in their slinky addresses basically proves that it was pretty bloody glam. Or for men, very “Marlon Brando”. Even Obama can rock the “do you have a light?” in this fake photograph. Thing is, we don’t REALLY do anything that is overly glam these days do we? We can’t smoke inside, and it’s just a bit of a faff really. Take a modern day glamorous event for example, like the Oscars or something, would mean a celebrity nipping out in their flats, under an umbrella (held by a bouncer/bodyguard) whilst they chuffed away on their fag and then nipped back in – breathing smokey breath over everyone. It doesn’t have the same ring to it. Same with the boys, it’s no longer ‘James Dean’ vibes is it? It’s more drunken men smoking and accidentally tapping their ash on your nice clothes. Thanks to the smoking ban our lungs have been spared slightly, but it’s still seen as cool and glamourised by celebrities and models. It’s still a myth that models look the way they do because they just chain smoke instead of eating 3D objects. 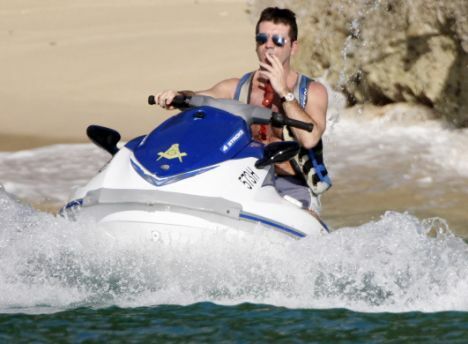 At least if I ever feel tempted to pick up another cigarette I could just look at the pictures of Simon Cowell smoking on a jet-ski. Totally grim. Good for you in fighting that habit. You will be so happy in a few years–the positive health benefits start immediately and compound over time.